Gardening and farm work can be tough, and having the right tools for the trade will make a significant difference in work speed and personal fatigue. I suggest getting something to help you lug around those heavy loads—but finding the best plastic wheelbarrow for the job can be tricky. Lots of factors, such as load capacity, wheel size, and handle height, can play a role in your decision. Keep reading for information on a couple of sound options, as well as tips on how to find the best solution for your needs. You will be getting all of those cumbersome tasks done in no time! This model is a nifty little helper. With a volume of 15.5 Gallons, it will be suitable for small to medium tasks and jobs. It will, for example, suit garden work very well, and can be used for both pruned branches, mulch, weeds, leaves, and many other kinds of materials. The cart has two plastic wheels, each 7 inches wide with a metal axle, and a telescopic handle. It can be used on different kinds of terrain and maneuvers easily around tight corners, trees, and bushes. Weighing in at a mere 6.9 lb, this cart can easily be used by both children, adults, the elderly, and everyone in between. Adjust the handle to different users. The telescopic handle can be extended or pushed in as the user sees fit, allowing the cart to be used by people of different ages and heights. A shallow bucket, making transport of shovels and rakes difficult. 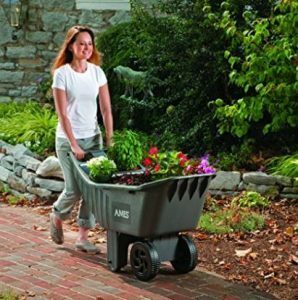 The Easy Roller cart from Ames features a four-wheel design along with a dedicated tool tray to store all the other helpers you need for a given job. If you need high volume capacity and a stable solution, this may be the best wheelbarrow for you. 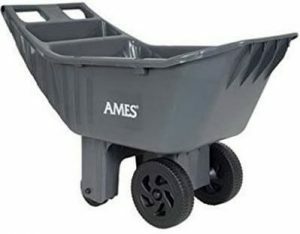 Ames has produced their cart from an all-poly material with tubular steel axle, and have implemented an extra-wide wheelbase to make the cart as stable as possible. The front wheels have a diameter of 10 inches, while the rear wheels measure 5 inches. While stable and able to handle high volumes, this cart is not the lightest, weighing in at 18 lb. A versatile plastic material, so you can use it in all weather conditions and all environments. The wheelbarrow handle being a bit on the short side, making some working positions uncomfortable. The Rubbermaid lawn cart sports a volume capacity at the middle of the spectrum and can deal with loads of up to 200 lb. 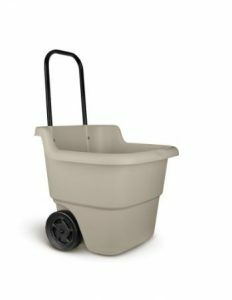 It is made from high-density polyethylene, meaning that it may be the best plastic wheelbarrow for your needs if you require a sturdy, durable solution. The design consists of two fixed wheels and an integrated handle. In the realm of gimmicks and extras, the wheelbarrow handles features a molded-in tool and beverage holder. The volume capacity of the cart is 3.25 cubic foot when loaded to level, and 4.5 cubic foot if loaded in a heaped fashion. At 14.66 lb, the cart weighs in as a medium-heavy device. A sloped side in the bucket, making some stacking of items difficult. 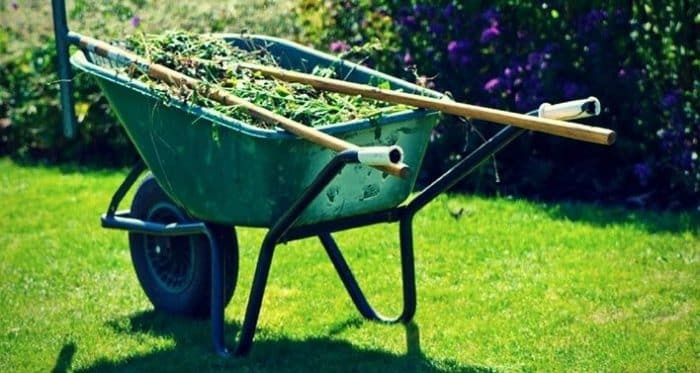 It is important to take several different factors into account when choosing the best plastic wheelbarrow for your needs and tasks. I particularly recommend considering the following aspects in relation to your requirements. 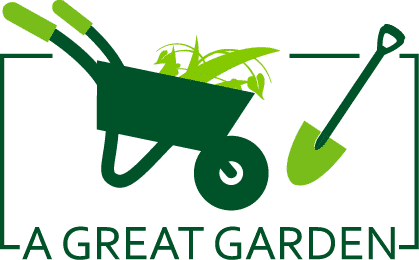 The load capacity of you garden cart will need to accommodate the amount of material and the kinds of tools you need to transport on a daily basis. Both the weight and volume capacity of the cart are relevant, and as is the ratio between the two. The number of wheels as well as the size and material matter depending on the terrain you will be using your cart in. Having four rather than two wheels means, that the cart will be more stable on uneven terrain while having two wheels may make the cart more capable of handling corners. Your decision to opt for a telescopic or a fixed handle should depend on several considerations. The major one would be as to who will be using the cart—only adults? Children as well? If different kinds of users will use the cart, they may need or prefer a different handle length. In the case of different users, I would suggest a telescopic handle. Being able to get your cart around any obstacle is paramount in ensuring an efficient workflow. Navigating sharp corners, working around trees or having to dodge rocks are all made easier by having a very maneuverable cart. Usually, a two-wheeled cart will be the easiest to get around such obstacles. Consider how much stability you need from your cart—this will, for example, depend on your terrain type. 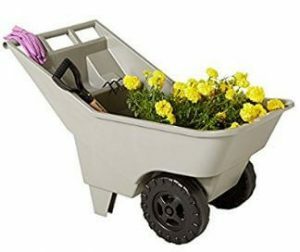 Choosing the best plastic wheelbarrow for your needs is vital whether you are planning a project, have ongoing work requiring one or simply intend to use it now and then. The Suncast wheelbarrow is lightweight, small and two-wheeled, while the Ames is heavy with a large capacity. 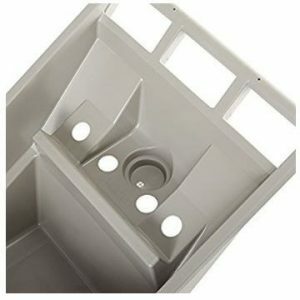 The Rubbermaid cart sits in the middle of the two with its medium capacity and weight. These three carts each offer different advantages and disadvantages and are aimed at different types of garden and yard work. First and foremost, you should evaluate what kind of work you will be doing—and after this consider factors such as load capacity, wheels, handle type, and maneuverability when choosing your cart, and whether you would prefer pulling or pushing the cart. If you take your time to weigh up the pros and cons of different designs with your work in mind, I am sure that you will find a cart that you will be happy with, and which will serve you well for years to come. Finally, among the three examples, I would recommend Suncast Polly Rolling Lawn Cart would be the best plastic wheelbarrow for you. This product is top Selling, long lasting, high performance and cheap wheelbarrow as compared to other plastic wheelbarrows.